Add an RS232 serial port to a notebook or desktop computer with this Plug-and Play USB adapter cable. The ICUSB232DB25 USB to RS232 DB9/DB25 Serial Adapter Cable (M/M) lets you connect 9-pin (DB9) or 25-pin (DB25) RS232 serial devices to your laptop or desktop computer through a USB port, as though the computer offered an onboard serial port. The integrated 3-foot (0.9 meter) cable allows it to be connected directly from the serial device to the computer without requiring additional cables. A cost-effective solution that bridges the compatibility gap between modern computers and legacy serial peripherals, this high quality USB/RS232 Serial Adapter cable ships with a DB-9 to DB-25 adapter for connection to varied serial equipment. The ICUSB232DB25 USB to RS232 DB9/DB25 Serial Adapter Cable (M/M) lets you connect 9-pin (DB9) or 25-pin (DB25) RS232 serial devices to your laptop or desktop computer through a USB port, as though the computer offered an onboard serial port. The integrated 3-foot (0.9 meter) cable allows it to be connected directly from the serial device to the computer without requiring additional cables. 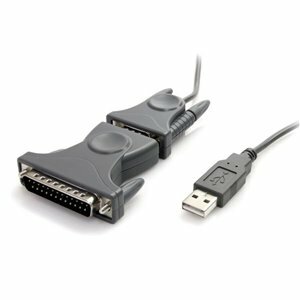 A cost-effective solution that bridges the compatibility gap between modern computers and legacy serial peripherals, this high quality USB/RS232 Serial Adapter cable ships with a DB-9 to DB-25 adapter for connection to varied serial equipment.